If you’re lovin’ lobster then Lobster ME is the place to be. Located in the Miracle Mile Shops in Planet Hollywood, this gathering place brings the Atlantic coast to the Las Vegas Strip. Feel as if you’re dining on the water in a fisherman’s shack with nautical décor and artifacts. The New England comfort food boasts rich flavors, premium ingredients and exquisite preparation. Whether you choose a lobster roll, lobster omelet, lobster mac ‘n cheese, lobster bisque or lobster tail you will thoroughly experience the finest tastes of this delectable seafood. 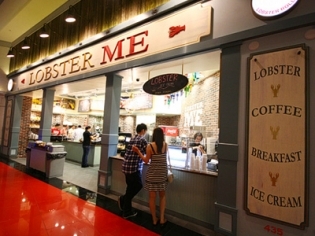 And for the adventurous, Lobster ME even offers lobster ice cream!! It was ok. That’s all. Nothing special.